It’s that time of year! The 2019 Nancy King Memorial Golf Tournament will be held on Monday, June 17, 2019 at the Charter Oak Country Club in Hudson, MA. The 18-hole tournament begins at 11:00 a.m. with registration and lunch. The tournament starts at 12:30 pm and you can choose from a scramble or best ball format for your foursome. 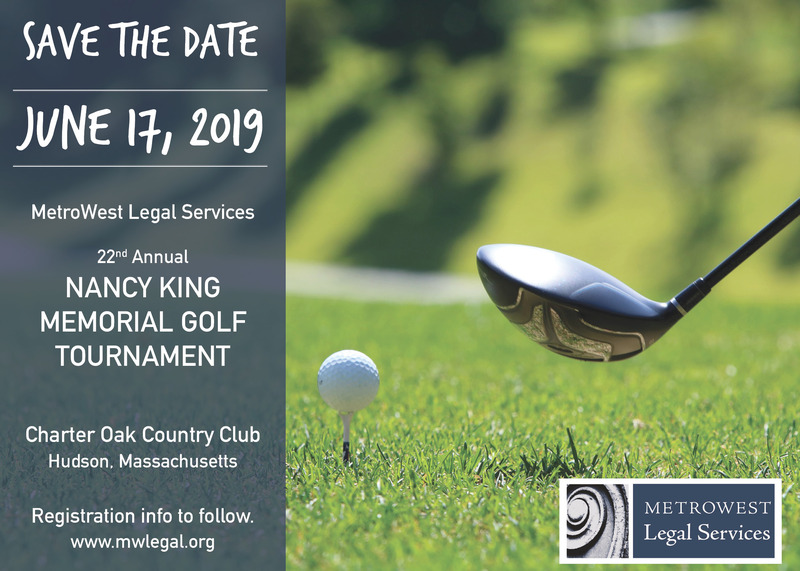 All proceeds support MetroWest Legal Services, the premier provider of free civil legal services for low-income residents of MetroWest. Click here for online registration and sponsorship payment. To register for dinner only, please scroll all the way to the bottom of the online form. For more information, contact Betsy Soule, Executive Director at 508-620-1830 x 230 or bsoule@mwlegal.org.